We love baseball. We love our home team (except occasionally when they blow it in the 9th inning!). We have friends that have travelled to every ball park in the majors – plus a half a dozen that are no longer being used! They have even been to some of the Double A and Triple A ballparks. Even though we don’t collect that subject ourselves, we get entranced when we find an image like the one shown here. It looks like a ball park, but there doesn’t seem to be a backstop behind home plate. There is a player in a white shirt who seems to be hitting practice balls to the infield – and maybe the outfield that we can’t see. There is a film camera behind home plate. And there’s a police officer on horseback, and other officers on foot for ‘crowd control’. There is a big crowd. It looks like 1920s – or maybe 1930s. The few women spectators are wearing hats. The men spectators are wearing an assortment of hats – including fedoras, caps, and ‘pork pie’ hats. 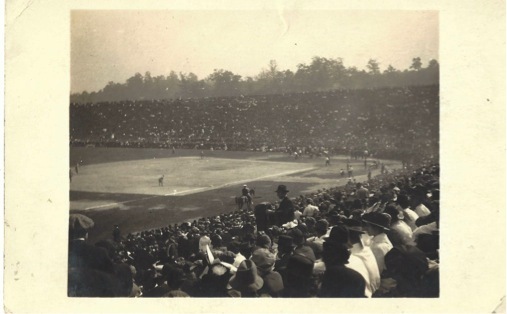 Are the men on the field playing ball – or making a baseball film? This was a very good sized stadium for its day, and so must have been in a major American city. But which one was it? O.K. you ball fans out there. Where the heck is this? It seems that even a hundred years ago many people needed cheering up. 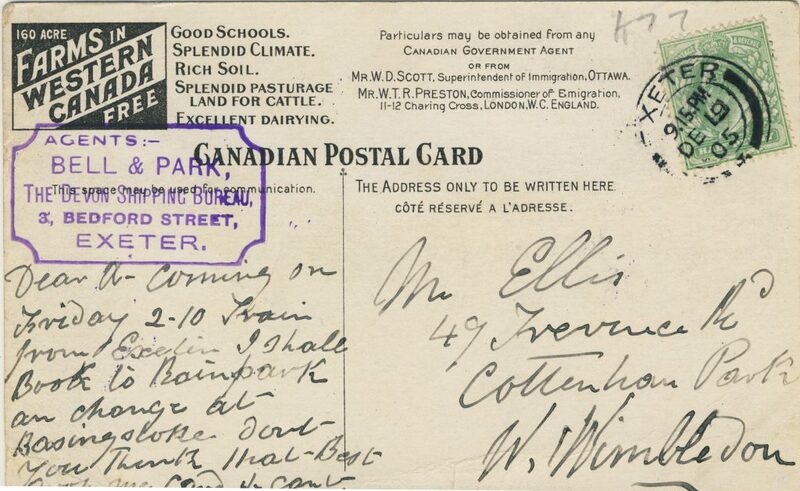 This Canadian Pacific postcard was produced and created in 1910. 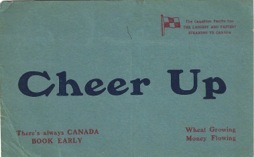 On the face of this card Canadian Pacific suggested some reasons for their readers to ‘Cheer up’. One of them was ‘Wheat Growing’. The other was ‘Money Flowing’. Hey, that’s not too different from today! The farmers are watching the skies intently for the needed rain to nurture their crops. And the rest of us are looking at our VISA statements and our bank accounts hoping that money will flow from somewhere to deal with the costs of our surprise expenses – or our spending excesses. You’re thinking that it’s only a postcard – how can that cheer you up? Well, it tells you that over the intervening hundred-plus years, you aren’t the only one who has had to grapple with difficult crops or daunting debts. And you probably won’t be the last. But if they survived – and most did – a little bit of luck and a lot of hard work will help you to smile through it all. So cheer up! 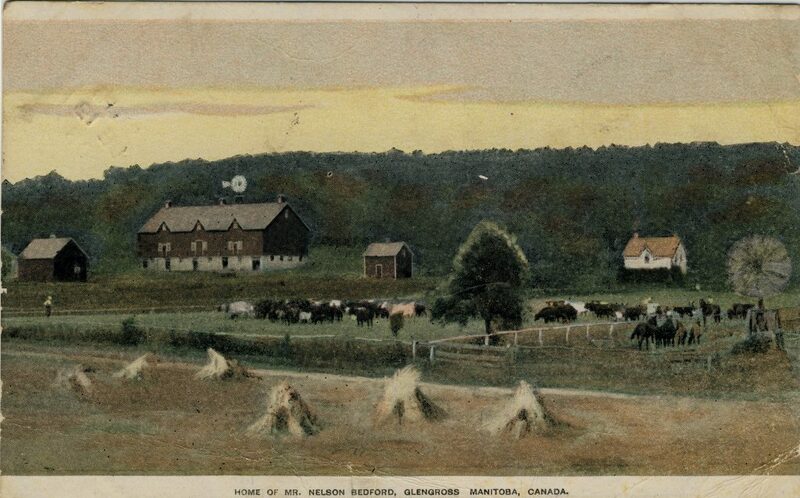 Mr. Bedford’s well-established farm may have been in operation for 40 years by the time of this image, making it an attractive candidate for “immigration propaganda” use. This might have been one of the oldest farms on the Prairies outside the immediate vicinity of Winnipeg. The postcard may have been handed out as a “freebie” by the Devon Shipping Bureau in an effort to drum up business. 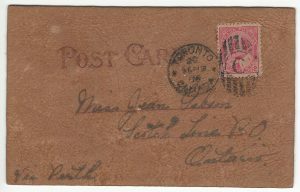 As is still the case, giveaway postcards were often not valued by their recipients and would often end up being used for minor notes such as this. A distinguishing feature of most of the Government Agent cards, illustrated by the Nelson Bedford example, is that they depict specific farms and actually name the owners. In this case, Mr. Bedford turns out to have been one of the earliest (1870s-era) settlers in the Morden, Manitoba district, just a few miles up from the North Dakota line. The reference to “Glengross” should read “Glencross”, but even with that correction the name might not mean much to those in the area today as the Glencross P.O. closed for good in 1909 (by which time Mr. Bedford himself had been dead for two years, after a life that was apparently marked by tragedy). In my experience, these cards tended to be collected rather than actually mailed, making the well-used example above somewhat uncommon. Of the 28 Government Agent cards in my collection, only 7 were posted — 5 in England and 2 in Canada. An eighth card was presented to a pupil at a school in Oxfordshire as a prize for composition. The predominance of English uses suggests that (as we might have expected) the cards were produced primarily for overseas distribution to potential emigrants. Amazingly, all but one of the dated cards from the U.K. were used within a period of about 50 days in 1905. Assuming that the missing year on the Winnipeg card was 1905, the Sept. 12 and Nov. 18 dates of the two Canadian uses suggest the entirely unsurprising possibility that the series was distributed a little earlier in Canada. But it seems that we can date the production of the cards, if only tentatively, to the spring or summer of 1905. 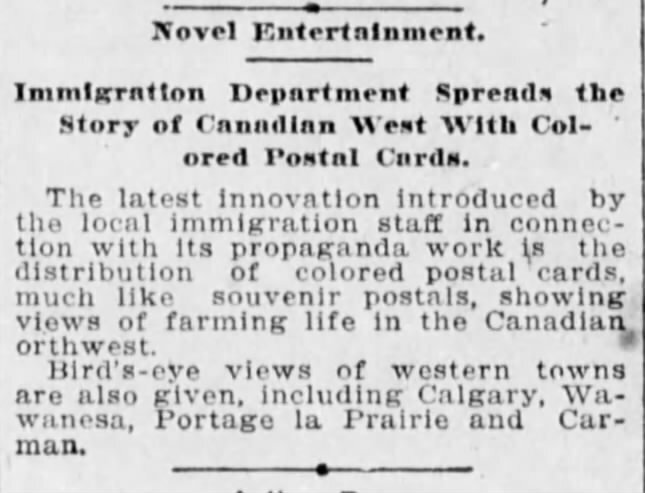 Fortunately, a piece of corroborating evidence has emerged, in the form of a short item published in The Winnipeg Tribune on July 24, 1905. The note appears to refer to a set of cards that is surely these selfsame Government Agent Cards — if only because three of the bird’s-eye views mentioned match the three known examples of bird’s-eye images in the Government Agent set. Besides the identity of the printers and the exact number of cards in the series, two great mysteries remain about the Government Agent set: who took the photos and why these particular farms? To these questions I have no answer, other than a very small piece of evidence that Alfred J. Sutton (later of the postcard publisher Gowen Sutton in Vancouver) might possibly have had some involvement. But — to look on the “glass half full” side — we now know that the cards were printed around June or July of 1905 and can further hypothesize (with some “poetic licence” and all due caution) that, after a few had leaked out around Manitoba and Saskatchewan, the bulk of them were shipped off to England for distribution mainly in relatively prosperous counties in the southern half of the country (perhaps with a view to attracting “the right kind” of farmer). Getting the cards into circulation in England must have involved a fairly intensive and concentrated effort by someone over a few weeks in late October and early November 1905. If anyone can fill in more dates and more places in England and Canada (or elsewhere), we can test and, as warranted, correct the hypothesis! Please feel free to leave a comment if you can help. Sometimes postcards are the leading edge of trends. Sometimes you just can’t be sure. 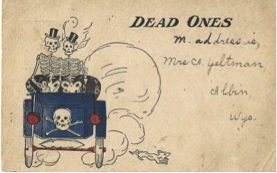 And that’s the case with this postcard featuring ‘Dead Ones’. What’s it about? 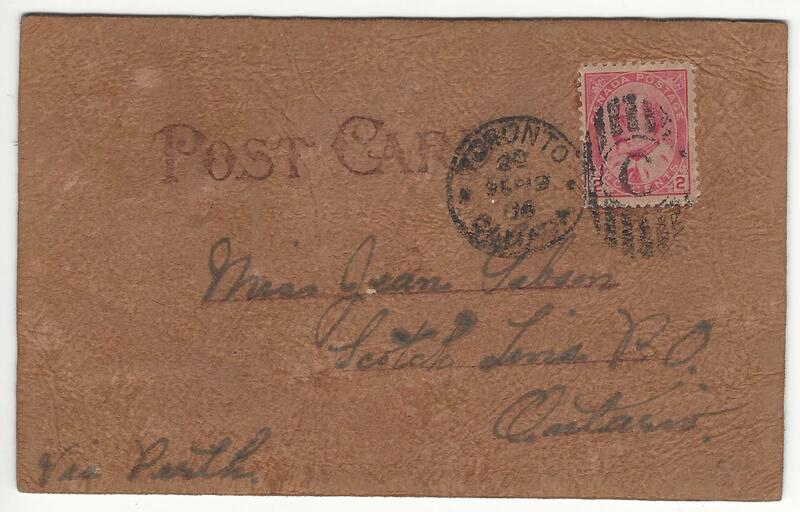 The card is postmarked from Osceola, Nebraska in 1908. “Where the heck is that”, you ask? A reasonable question. A bit of internet research shows that Osceola’s population peaked in 1920 at 1,200 people and by 2010 that number had declined to 880. So it’s a small, unimportant town in Midwest America. Reportedly Osceola had a major fire in 1895 which left only two buildings in town standing. But that was a full 13 years before this card was sent, so it would be a little late to have anything to do with the fire. The mystery must have had another solution. These two people are in an automobile. Was the postcard memorializing a fatal car crash? I don’t think so. There are postcards of major disasters, but not of automobile fatalities. Let’s look again. 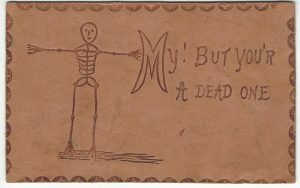 If you looked carefully, you would have seen what I did when I bought this card several years ago – even though it had nothing to do with what I collect. Mystery solved. 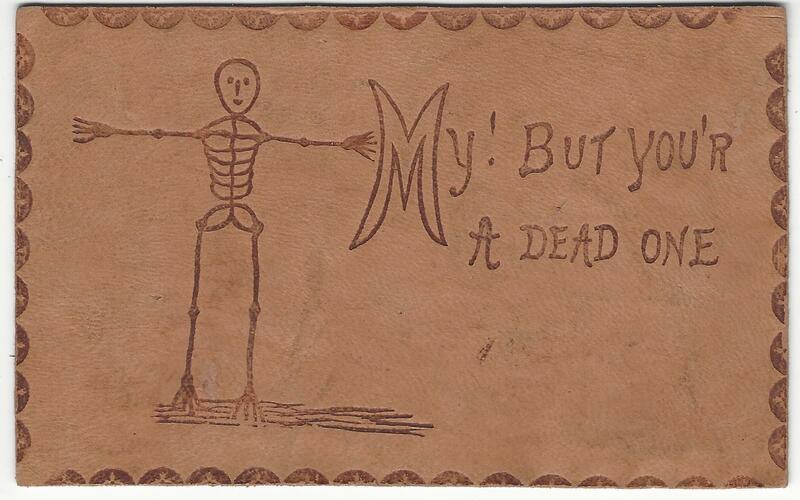 My thesis is that this is an anti-smoking postcard. Ironically, it would be just as timely today as it was 108 years ago. The message makes no reference to the image on the front, so presumably the belief was that this card would speak for itself. It’s certainly a long way from the ‘pretty’ card that the sender reports receiving from the addressee, but it’s an amazing piece of social history. 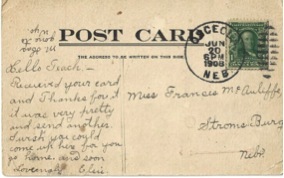 Reverse of the postcard, posted 20 June 1908 at Osceola, Neb. Hey, that’s just one of the delicate questions from their children that Mommy or Daddy has to answer! In this case, a picture is worth a thousand words – and a lot of embarrassed er…uh…mumbling. 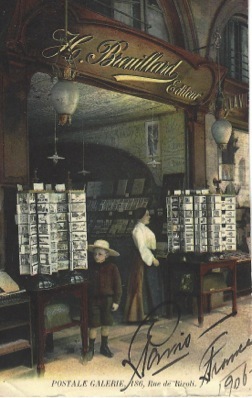 They can tell Julie – or Johnny – that many, many years ago postcards came from shops like this one in Paris. See the youngster looking at the choices? Well, you will also note the serious woman watching him closely, in this era well before video surveillance! Video was not known, but theft was. How will he decide on which card to purchase? Well, it’s not unlike when you have to decide what you’re going to select from Netflix or other video providers. It isn’t easy. 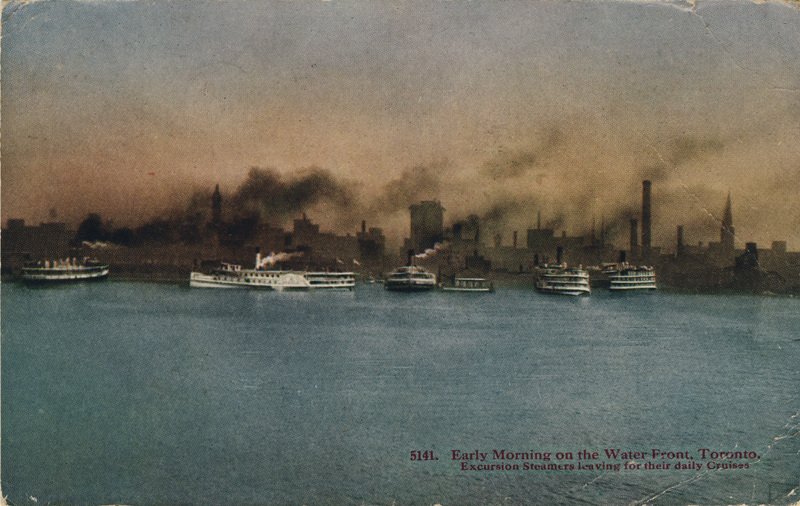 Today’s postcards are fewer in number, but we still have the survivors of the billions of postcards printed in the era of this picture as well as today’s production. Great images. Great history. Great hobby! P.S. In case the 1906 date on the postcard makes you think you’re a bit late to get your postcards, it appears that some may still be available! Click the link – 186, rue de Rivoli seems to be the address of the first two or three shops in the Streetview image. Error: Error validating access token: Session has expired on Friday, 12-Apr-19 20:21:58 PDT. The current time is Tuesday, 23-Apr-19 21:25:24 PDT.